An Undead Digimon that was produced from a Mammon, revived from an ancient glacier, that continued to battle with Virus-species Digimon. Although its whole body was eaten away by a virus and became nothing but bones, its survival instinct as a Vaccine was strong so it continued to battle even in death. For that reason, it seems to have already lost all of its emotions and intelligence beyond destroying Viruses. 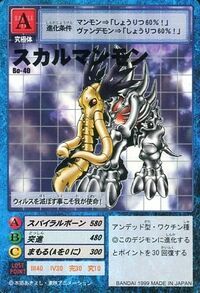 Although it continues to battle in safety, its weak point is thought to be the Digicore that has been bared in its chest. 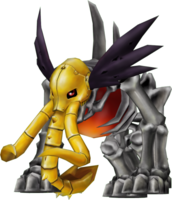 It is thought that right after this is attacked, Skull Mammon will become unable to maintain its vital functions. 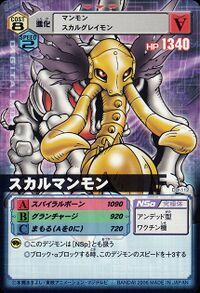 Its powerful Special Move "Spiral Bone", which defeats Viruses, is a technique in which it rapidly spins and then throws a vertebra-shaped bone. | Skull. Mam is short for mammoth. 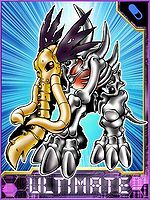 Skull Mammon evolves from Mammon with 0+ DP or Were Garurumon with 0-7 DP. 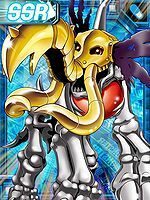 Skull Mammon is only obtainable as a collectible card. 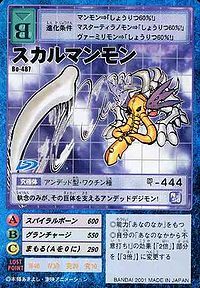 Its card is part of the Undead Monster (アンデットモンスター Andetto Monsutā) set. 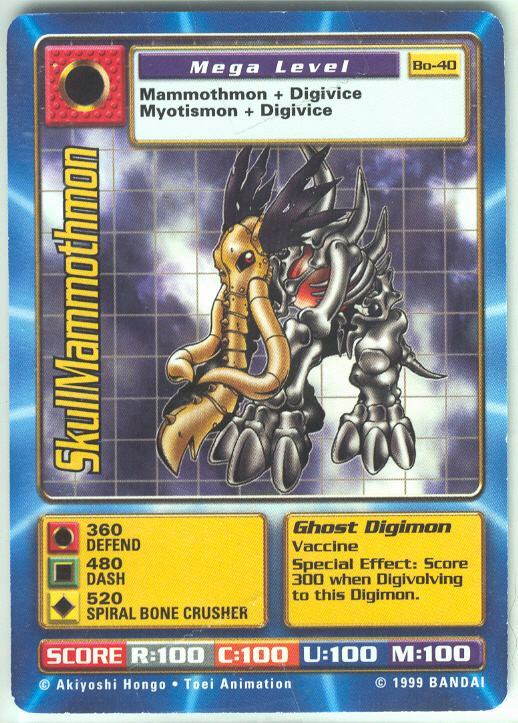 Skull Mammon is a minor enemy Digimon. Skull Mammon is available as a Digimon Medal. 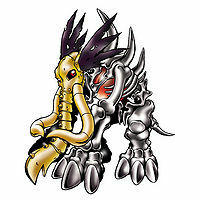 Evolves from Mammon or Were Garurumon. Its duty is to annihilate viruses! Persistence is the only thing holding up this undead Digimon's large frame! This page was last modified on 21 March 2019, at 17:47.